In creating a website within Blogger, one of our first real challenges was developing a way to provide a slideshow within the website that was fully customized to the needs of the design, but also could be managed by the site owners without needing to know HTML. The "embed slideshow" provided by Picasa didn't cut it for a number of reasons (limited customization, auto-start issues, didn't loop, was Flash, etc. ), the widgets that people had created were also as problematic and both provided too many features that we didn't want while also not providing the features we did want. We embarked on the quest to create the perfect slideshow, the slideshow that could be easily customized, but still contained easy to use management functionality so it could be handled by a non-technologist. Nothing like a simple step to get the process started. Create your album, preferably with a simple name, no special characters, and no spaces if it can be helped. Add photos to the album. Give your images captions by clicking on the "add caption" link below each of the photos. Change the "visibility" to be "public on the web" and hit Save changes. Going back to the main album page, click on the link for Organize to set the image order within your slideshow. You can set the order of the images in your album by a default order (such as by date or filename, or you can click and drag images to set your own order. Once done hit the Done button to save the order. There is a lot of code here so unlike our normal practice of including it we're just pasting the clean version. Using the divs of "slideshow" and "caption", you can place them anywhere within your page template and customize their dimensions using the CSS that is provided (or your own CSS). Change the heights and widths to suit your needs and the slideshow information will automatically fill them out properly. This information goes below the <body> tag but before the </body> tag, just about anywhere in your template. Questions or comments, please feel free to leave them in the comments below. If we make updates to the script we will post them here. 2012-09-27: Per request we have added a random sort feature to the slideshow! Here is the code. 2012-09-29: Per request we have transformed the script into a function call! This allows you to place all of the script information into the template, but then place the style, divs, and executing script into a static page or blog post, and to set different albums for different pages within the site! Here is the code. sorry i must be a real dummy,do i really paste all that code into the blogger html? In a sense, yes. But, like our other scripts, you will likely want to use if statements to say "only display on this page" or place those divs into the page in places that you want the slideshow to appear by using HTML widgets in your template. 1. Is there a way to shuffle the images with this method? I want the slideshow to display images in the album in random order. 2. I want to create slideshow using my default blogger album, which I add images to with every new blogger post I make, and I want the slideshow to grab all images in the album. Do I still have to set the variable var picasaResults? If I currently have 100 images in my album, can I set the var to 1000 so I don't have to edit the code every time I add a new image to the album? Do you want each slide to be random, or a random sort of the initial array so that it goes once through and then repeats in the same order? Yes, you can set the var to 1000 so you don't have to edit the code. It may be that this code is not intended to be into into an actual post? I'm confused... Is this code to be used for the complete site? In other words, added to the site template? I'm using Dynamic Views and am not sure if I can add it. Correct, not within a post, within the template. Hi Enrique, please check out our new variation on the script which allows you to execute it from a page or post as well as place the div containers within the page/post. 1. Is this only for the dynamic views or does it work on classic blogger too? 2. Can I use it in posts etc.? For an example, I like to make posts including a slide show each with different pictures. From my little experience, I feel that some part of the code, goes into the template, (which stays to serve all the slideshows to follow), and the other part goes into the post (html editor). In that case which part of the code you have posted, goes where? Hi Nikos, per request we have transformed the script into a function call! This allows you to place all of the script information into the template, but then place the style, divs, and executing script into a static page or blog post, and to set different albums for different pages within the site! Here is the code. OMG! Thank you very much! It's perfect! It's all I want in my blog. This tutorial is fabulous. Simple and practical. I only wish it were not necessary to put the album open to the public, but limited, because would not that my photos were found by other users picasa or ending up in Google. Also would like to know how to insert navigation arrows to the slideshow, it would be very interesting. Thank you! 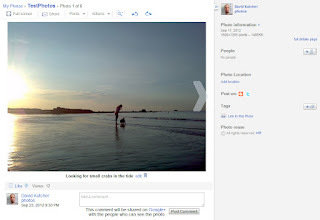 Hi John, putting an album in Picasa as public is no different than the normal action of adding a photo to a blog post; both are public at that point. This script is just one example of a slideshow; you can populate any type of slideshow (the internet has tons of different scripts with different features). Hi John, please consider commissioning us to build this functionality for you if it is something that you want for your website. It is a bit too specific for what we're posting to this site as we're trying to build tutorials that also contain generic examples/scripts/tips. I don't know many about codes, Just doing trial and error, I paste the code as HTML and give my picasa Id and album name but it isnt showing any slide show only black blank and when i click it turns to a blue not more than that can you give me some hints. Where in your site are you placing the slideshow so that I can see the code in action? for now I have just placed it above the my blog post. I have given the name as "slide".I paste the code with randomness function, If I paste the code with your gmail ID and album name as given in link should I see your album sliding Just for confirmation. It doesn't show even i put my Id and album name. Hi Sagar, can you please provide a LINK to the post/site where you're having the trouble? Because of the way that the page is loaded you need to place the code into your TEMPLATE, not into a Gadget/Widget or the post page. Place it into your template before the < /head> tag. Hi Miguel, thank you! We are a web design and web development firm based in Massachusetts. You can see some examples of our work on Blogger as well. Thank you very much now I understand, as you mentioned I was trying it as a Gadget.now it worked , But can i place it on the sidebar instead of the top of the blog or not?? Thanks for the wonderful article but I seem to be getting a "Your HTML cannot be accepted: Tag is not closed: SCRIPT". Any idea where I might have gone wrong? I'm posting this into a page. On a side note, I've been spending 2 frustrating days trying to get a proper slideshow on my site! Hi Noah, please link me to the page? Did you put the script into the template as instructed and then REFERENCE the script from the static page? did you close your script tag with a < /script>? I'm trying to embed the slideshow into a post or page. Ah, I must've missed that out on putting in the template first. You mean after pasting it on the template I re-paste the whole theme unto the static page again? Hi Noah, please visit this code. Lines 73-88 go into the page or post that you want to add the slideshow. Customize as necessary in the function call of line 88. Great work guys! This is amazing. I've loaded this as a simple home page entry. I take photos as a hobby and I'm not charging anyone for them. All I want is for people to view them on my Blog so I want to make the Blog experience as close as possible to the Picasaweb experience. I've written a simple PHP script to take a Picasa username with album name and drop out simple HTML code that can be dropped into the Blogger Post. The end result being something like http://www.who-els.co.za/2012/10/nvsd-show-time-2012.html but the obvious page size is the problem. Ideally one would want to do something like your script, but allow the visitor to Facebook, Google+ or Twitter the single photos of there child out to the family, bringing them back to the Blogger site. Hi Johan, I'm not sure I fully understand what you're trying to do; please email me at david@confluentforms.com and we can discuss further! I'd like to encourage you to read the code. In the first few lines we have variables such as speedIn, speedOut and pauseShow. Those are the speed variables. The slide show is meant to fully fade out before the next one fades in; that will not be easily changed. To get a border around the area that doesn't fade in/out, set a CSS border on your slide show's container div, not the image. Oh, and the other question... when I scroll down on that page, whenever the slide changes to the next image, it forces me back up to the top of the page and it does that with each slide. Is there a way around that? Especially if I wanted to add content underneath the slideshow, viewers wouldn't be able to go and read the content without being bumped back up to the top of the page because of the slides changing. In your CSS you need to specify a height for your slide show container div, such as 500px. It's forcing you back up because, without that height specified, the page is resetting. I apologize, I guess I am confused- I do already have a height of 500px set since that is what your coding listed generically. You must be talking about a different area? Hi Amanda, what is the URL of your slideshow? Hi Amanda, I meant the url within you blog. Should have gone with my first thought and sent this! Here ya go, and thank you. You are amazing! That fixed it. Thank you so much for your valuable information. When I officially make that site live, and blog about it, I will certainly write about the great code & help I got from you! These are great tips! I've been using Picasa and this Web Album that I'm using now. They are both great and easy. Thanks for sharing the trick on this custom slideshow widget. Superb, Mr. David. You have done a great job. I would love to watch your hangouts. 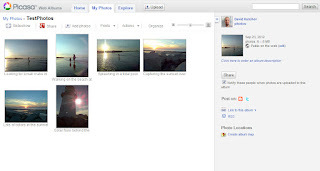 I found your article when I was trying to showcase my google/picasa album. I do not know what I'm doing wrong. I just can't seem to even get the script to work. Hi Brady, it should work just fine, you just need to include a Google JSAPI key/script along with your JQuery library. Really struggling to come to terms with an overload of information. Am trying to show driving test passes on my website at www.richardharper.net but using picassa photo via google, not showing in anything other than laptops......here's the code embedded into my website. Hi Richard, it seems you're referring to Picasa's standard Flash slideshow, which is not what we're doing with this code on this tutorial. That slideshow that you're using will only work on devices that can play Flash videos, so for example it might not work on your iPhone. At the same time, that code does not look right; I'd go back to your Picasa album and make sure you've got the right code. Although the slideshow works in blog posts as promised, when uploading a new post, the slideshows in earlier posts disappear, leaving only a blank space - unless each individual post is loaded from the ARCHIVE list in the right hand column on its own "page". Is this correctable? See < barcelona052013.blogspot.com > for an illustration of the problem. Also at the bottom of each slideshow there appears to be an empty space that I would like to eliminate if possible. The reason why the older slideshow is showing blank is because when you're initiating the slideshow via the function calls, you have the same target objects in the function. In both cases you've put it as #slideshow and #caption. If you have multiple items in your DOM with the same ID, the function will only change the 1st instance of that ID. Change the div ids, and change the target ids in the function call to match. Thanks for your help! All works fine now. I had tried changing the div ids and the target ids earlier but missed the first set in the series until you pointed out the need to alter all three instances. Now I can sit back and actually enjoy posting all the images I'll be creating starting next week in Barcelona! I am not familiar with coding period. I'm confused as to what to do. I posted the code before the but it's just blank. Do I just post my email and album name? Do I need to delete the instructions? What's the point, right? Do they think you're actually going to click on that link? But at the same time you want the form there, don't want to make it too hard for users to fill out, but would prefer to limit the garbage that you get. A CAPTCHA is what you need! While this was easy in PicasaWeb, it's a bit more challenging in Google Photos... if you've found a better way please share them below! The way we've found that works best is via the JSON view of all of your albums in your account. another method is by going to https://get.google.com/albumarchive, which will then redirect to https://get.google.com/albumarchive/[User ID] (thanks +Peggy K! This is what the URL needs to look like; replace the XXXXXXX with your own User ID from above. One of the "limitations" to Blogger is that you don't have access to a database to create fields for populating content. In previous posts we've showed you how to create a form using Google Drive and to incorporate it into your Blogger website; in this tutorial we're going to show you how you can also use that same content, stored in the Google Drive Spreadsheet, to populate your site with the content, as well as content from any other Google Drive Spreadsheet.